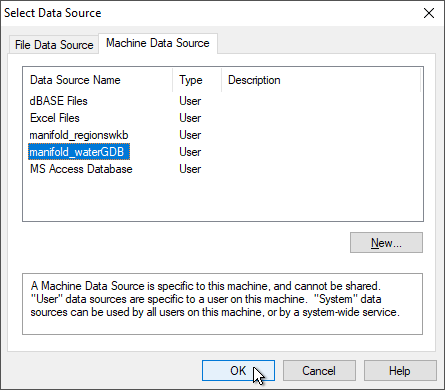 This topic provides a step by step procedure to connect from Manifold System Release 8 through a Manifold .map file using Manifold's ODBC driver, to give Release 8 access to ESRI GDB file geodatabase data sources that are linked into the Manifold project. We use Manifold facilities as an intermediary to give Release 8 capabilities it does not have on its own, to link into data stored within an ESRI file geodatabase. The ESRI GDB file database used is the same one created as a Manifold data source in the Example: Connect to an ESRI GDB File Geodatabase topic. Although we use Manifold System Release 8 as the ODBC-capable application in this example, the same technique works for nearly any ODBC-capable application. For example, we could use LibreOffice or Microsoft Access to connect through Manifold using ODBC to get access to data sources to which LibreOffice or Microsoft Access could not connect on their own. The Example: Connect LibreOffice Through Manifold to an ESRI GDB companion example to this topic shows how to connect LibreOffice Base, the database part of LIbreOffice, through Manifold to link an ESRI GDB file geodatabase table into LibreOffice. 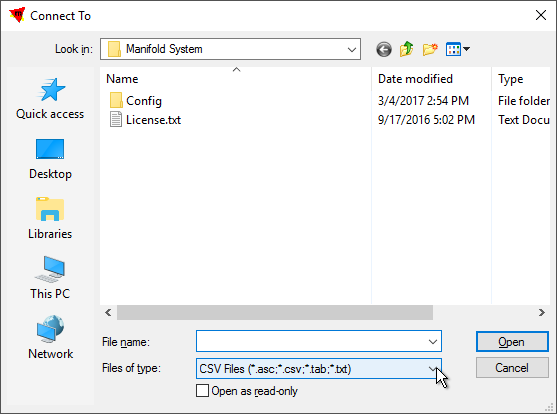 The Manifold ODBC driver is automatically installed when installing Manifold using a Windows Installer installation package. When using a portable installation we must run manifold.exe - install from a command prompt window to install the Manifold ODBC driver. See the Installations topic for a quick guide to using portable installations. Windows maintains a list of ODBC data sources to which ODBC-capable applications can connect. To enable an ODBC-aware application to connect to a Manifold data source we must create an ODBC data source in that list. An ODBC data source is also called an ODBC DSN (for Data Source Name). It encapsulates necessary information for the connection, such as a what driver to use, the data source that driver can expose and various options the driver allows. Use an ODBC-aware application that provides dialogs to create an ODBC data source. Manifold System, Radian Studio, Manifold Release 8, LibreOffice and Microsoft Access are typical examples of applications which support creation of ODBC DSNs through their menus and dialogs. The Example: Connect to Manifold from Release 8 example topic shows how Manifold Release 8 can be used to call the ODBC data source creation dialogs. Utilize the Microsoft Windows ODBC Data Source Administrator dialog that is built into Windows and is available in the Windows Control Panel. 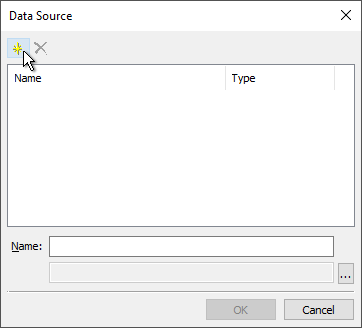 This is a useful way to create an ODBC data source for applications such as QGIS which can use ODBC but which are not able to create an ODBC data source. 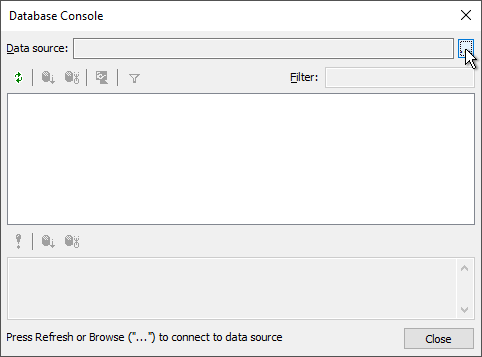 The Example: Create an ODBC Data Source with Windows topic provides step by step instructions for using the Windows dialog to create a new data source. In both ways of creating a new ODBC data source both Microsoft dialogs and Manifold dialogs will appear. Both Release 8 and the Windows tool will call Microsoft dialogs as part of the process, and those in turn will utilize the Manifold ODBC driver we specify. As part of the creation process, the Manifold driver will open its own dialogs to enable specification of options supported by Manifold. 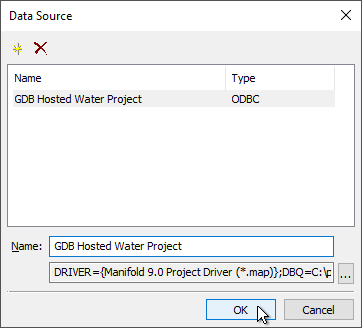 The primary choice offered by the Manifold ODBC driver is whether the new ODBC data source will connect to items stored in the .map project file, as shown in the Example: Connect to Manifold from Release 8 topic, or whether the new ODBC data source will connect through the .map project file to provide access to external data sources that are linked into the project. Manifold has the highly unusual capability to act as an intermediary between an ODBC connection coming into Manifold and some other, external data source that is linked into the project. Applications which are ODBC-capable can utilize that Manifold capability by connecting with ODBC through Manifold to other data sources for which no ODBC driver is available. This example shows how Release 8 can connect via ODBC through a Manifold .map project to work with data in an ESRI GDB file geodatabase, a data source for which there is no direct connection capability within Release 8. Important: Except for the first two illustrations showing a Manifold project, the illustrations in this topic show Manifold System Release 8, not Radian-based Manifold System. We will connect to a Manifold .map project file for the project shown below, where we have created two data sources that are Radian connections to ESRI gdb file databases. 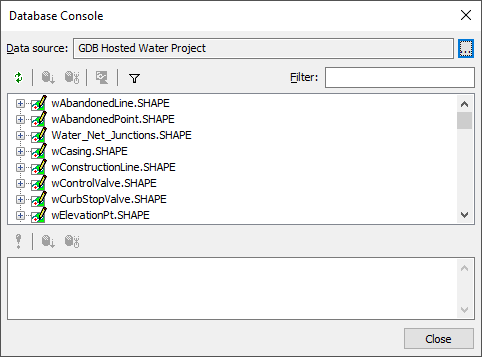 Both are example GDB data sets published by ESRI, one of which, called Gas in the project below, contains gas utility structures and the other, called Water in the project below, contains water utility distribution structures. Both are in Naperville, Illinois, in the US. In the illustration above we have expanded the Water file geodatabase source to show some of the many drawings and tables in that GDB. The data for both data sources resides in ESRI file geodatabase files, not in the Radian .map project. Launch Manifold System Release 8.00 and then choose Tools - Database Console. In the Database Console click on the [...] Browse button. In the Data Source dialog click on the yellow * asterisk icon to add a new data source. That launches the Connect To dialog, which provides a wide variety of data sources and files to which we can connect. In the Files of type box we click the pull down menu down arrow to see more choices. In the Files of type box we choose ODBC Data Sources (). That immediately launches the Select Data Source dialog. 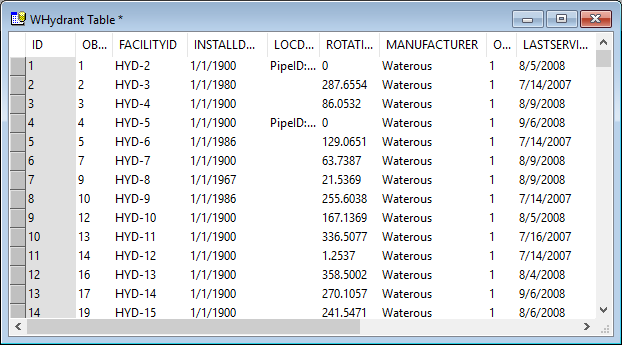 In the Select Data Source dialog we see the manifold_waterGDB data source created in the second part of the Example: Create an ODBC Data Source with Windows topic. We click on it and press OK.
Back in the Release 8 Data Source dialog we provide a memorable name for this data source and then press OK.
Like magic, the Release 8 Database Console now shows all of the drawings in the ESRI GDB file geodatabase, even though Release 8 itself has no knowledge of ESRI file geodatabases. The drawings we see in the Database Console remain stored in the ESRI GDB file geodatabase. 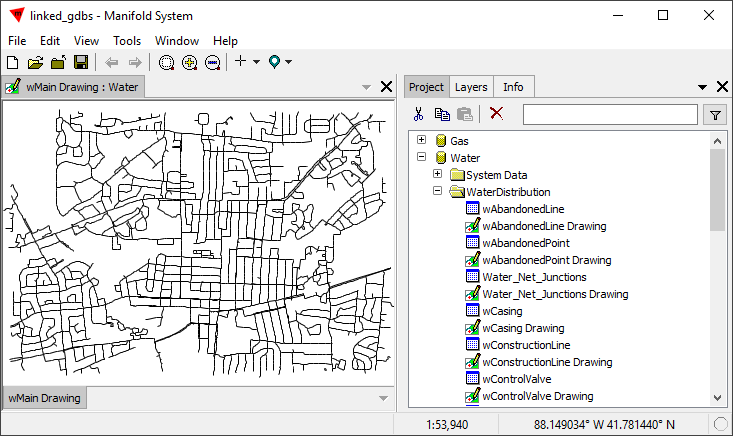 Radian is acting as an intermediary to connect to the ESRI data source and to provide those drawings for linking into Release 8 in a form that Release 8 understands, a bit of magic made possible by Radian and the Radian ODBC driver. 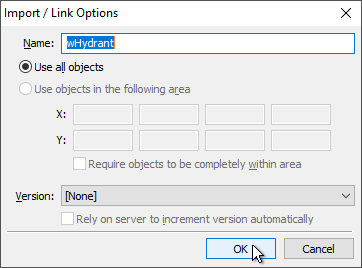 In the Database Console we can click on one of the drawings, the wHydrant drawing and then press the Link button to link it into the Release 8 project. Press OK to use all of the objects. A new, linked drawing appears in the Release 8 project. The data for that drawing remains in the ESRI file geodatabase. It is dynamically brought in on the fly through Radian into the Release 8 project. 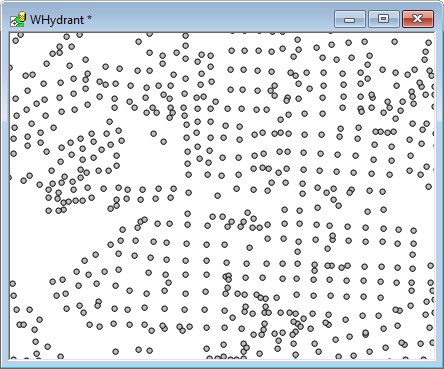 If we click the drawing open we see it is a drawing of points that show the locations of fire hydrants in Naperville. 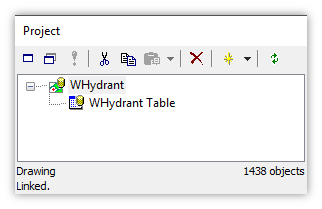 We can click open the drawing's table as well to see information about each hydrant. The linked drawing and table are fully "live" data within Release 8: we can make selections, use the data in queries and so on. 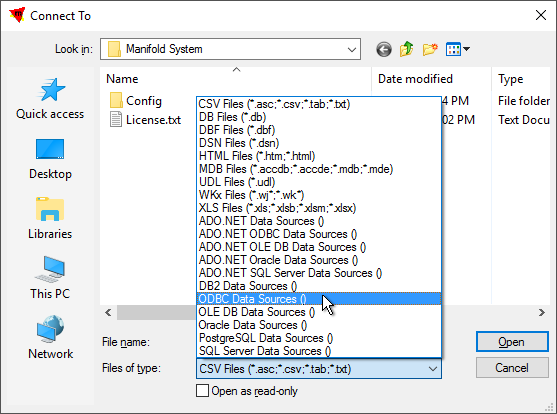 To show the above functionality is available to any reasonably ODBC-capable application, see the Example: Connect LibreOffice Through Manifold to an ESRI GDB topic, which continues this example. Double quotes are OK - The Manifold ODBC driver allows enclosing identifiers in double quotes, to work around a limitation in newer versions of QGIS. Example: Create an ODBC Data Source with Windows - How to create an ODBC data source (a DSN) using dialogs built into Windows 10. 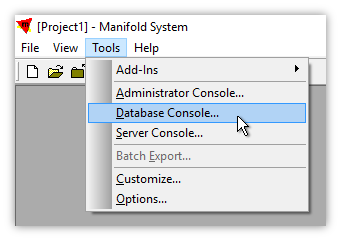 Example: Connect to Manifold from Release 8 - Step by step procedure to connect from Manifold System Release 8 to a Manifold .map file using Manifold's ODBC driver. Example: Connect to an ESRI GDB File Geodatabase - Connect Radian to an ESRI GDB file geodatabase, display the contents, make a selection in the GDB and overlay in a map. 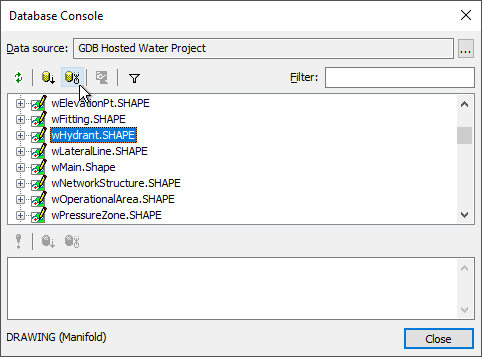 Example: Connect to Manifold from QGIS - Step by step procedure to connect from QGIS 2.8.9 to a Manifold .map file using Manifold's ODBC driver.